PHOENIX, Jan. 16, 2019 (GLOBE NEWSWIRE) -- SingleSeed a subsidiary of SinglePoint (OTCQB:SING) a fully reporting company providing mobile payments, ancillary cannabis services launches PHYTO-BITES on SingleSeed.com. The company’s subsidiary SingleSeed.com has added a new vertical to its robust product line up. Serving pet owners with a brand-new offering that is formulated to reduce stress, pain, separation anxiety and inflammation. PHYTO-BITES is manufactured and supplied by CBD Unlimited formerly (Endexx) (OTC:EDXC). The two companies are working collaboratively to distribute this product online and in store all over the nation. SingleSeed is the place to purchase CBD products in the United States. All of our products are Federally approved for legal sale and we ship Nationwide. According to GrandView Research the global pet care market is expected to reach USD 202.6 billion by 2025. Based on type, dogs held the largest market share. SingleSeed plans to make PHYTO-BITES one of its premier offerings because of the size of the market and the market penetration potential. Go to SingleSeed.com and use promo code CBDFORME to get 15% off your first order*. “We are very excited to add this to our list of products. The pet market is a tremendous opportunity and we plan to attend and use all our contacts to promote this product at every opportunity we are presented with,” states Greg Lambrecht CEO. From SingleSeed blog CBD for Pets – “We love our pets. Raising pets like they are members of our families means we go the extra mile for them. Especially when it comes time to address their health problems. More and more pet owners are turning to CBD to help their buddies in similar fashions. 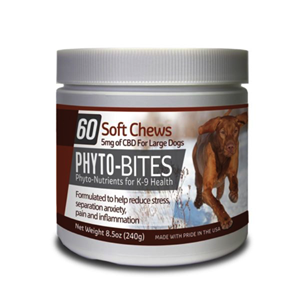 Phyto-Bites CBD Soft Chews are for use in dogs and are formulated to promote health and support the reduction of separation anxiety, pain and inflammation.” Follow this LINK for full article.